Genesys Regional Medical Center at Health Park is a state-of-the art hospital located in a beautiful park-like setting. This remarkable 21st-century facility is set on a large campus that has a hotel-like atmosphere. The quality of the hospital and care is second to none, but the individual nursing care is the particular focus of this facility. This facility has some of the highest nurse-to-patient ratios in the state, which results in excellent patient care and high satisfaction ratings. Genesys Health System is a member of Ascension Health, which is a group of affiliated medical campuses across the country having a mission and history of improving the communities’ health for which it serves. 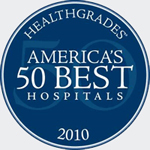 Genesys has been recognized by HEALTHGRADES™ to be among America’s 50 best hospitals for the last four years in a row. This distinction is exceptional and is an accurate reflection on the overall quality of this hospital. Genesys is accredited by JCAHO, HFAP (Healthcare Facilities Accreditation Program) and the state of Michigan Department of Consumer & Industry Services (MDCIS). Genesys Regional Medical Center at Health Park has attracted fellowship trained top-physicians and has been able to treat some of the most complex patients successfully. This hospital provides state-of-the art care for the entire mid-Michigan region and has a mission of “…creating hope through healing”. Deeply rooted within the mission statement is a reverence for their heritage and values. The purpose of Genesys stems from a mission of care that spans four centuries and can be seen within the sacred work they carry forward each and every day. Genesys advocates for a compassionate and just society – one in which they are committed to embracing and serving all people with special attention to the poor and vulnerable. Ultimately, it is their heritage, their commitment and position to be a leading and innovative provider of spiritually centered holistic care that allows the physicians and staff to create hope. Genesys is deeply committed to caring for the most complex patients and is very supportive of Dr. Iddings’ efforts to provide the highest level of cancer care to the patients which he serves. This 21st-century facility provides the highest quality of care and is an excellent choice for your treatment. In addition to providing the highest quality and state-of-the-art nursing, Genesys Regional Medical Center at Health Park offers a luxury and deluxe feel to patients and their families during treatment. Service of the Poor: Generosity of spirit, especially for persons most in need. Reverence: Respect and compassion for the dignity and diversity of life. Integrity: Inspiring trust through personal leadership. Wisdom: Integrating excellence and stewardship. Dedication: Affirming the hope and joy of our ministry.